Marie Kondo's bestselling book on decluttering captured many imaginations because of its promise to transform busy, disordered homes into serene spaces of inspiration. Those of you who open your sock drawer and beam with satisfaction at neat, folded rows of socks arranged by color palette know what I'm talking about. Sock drawers are one thing. Minds and everyday lives are another. I enjoyed a boon this summer spending in-person time at Feathered Pipe Ranch with some uncommon teachers who are walking the talk of practicing with ease, simplicity, and serenity. After Erich Schiffmann took his sabbatical from teaching, I fretted. Not one day goes by when I don't miss looking forward to the next time I can dip into the yoga well with Erich in person. But the good news is that there are increasingly prominent, practiced, and wise yoga voices coming of age — and growing in prominence — who are brave like Erich. They meaningfully advance the conversation about, and inquiry into, practices that nourish something more enduring than the whiny, mercurial, and eternally dissatisfied voice of ego. Plenty of yogis never bothered flirting with Instagram Yoga, but since web-ville and new studio storefronts are so littered with it, it can be exhausting to wade through and difficult to remember that a customized, beneficial, breath-centered practice that's relevant to the way a messy life plays out each day is possible. It's within our reach to experience the windfall that comes from just being alive. Joseph Campbell said we’re not so much in search of the meaning of life as "an experience of being alive, so that our life experiences on the purely physical plane will have resonances with our own innermost being and reality, so that we actually feel the rapture of being alive." My ten-year old cat Wilson had an arguably lousy start to his life. Before he landed in foster care, and eventually in this house, he spent four dreary years confined to a windowless bathroom with little company, lousy food, and almost no affection or care. He had every excuse to be a neurotic, bitter, reclusive, miserable cat. Wilson was never one for excuses, however, and he picked door number two instead, dropping with confidence and ease into his new, serene life where n-o-t-h-i-n-g rattles his inner calm or topples him off the peace beam. He is admirably stubborn about claiming his peace, he gives and receives affection without flinching, and he shows zero interest in anything resembling unhealthy co-dependence with his staff. He's no Erich Schiffmann, but he's a solid teacher with great promise. 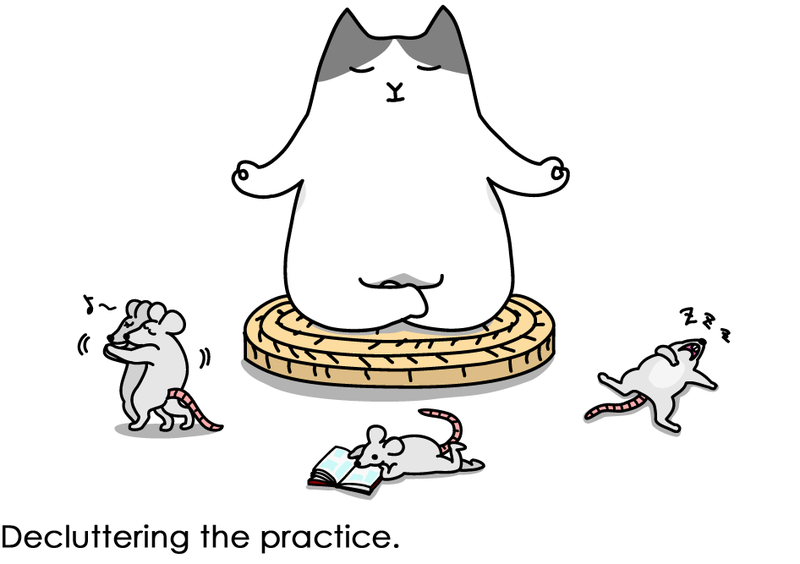 Serenity meow. After spending time in June with J. Brown (he's the amazing "Gentle is the New Advanced" guy) and then in August with Gernot Huber (he's a big, serene "wow" that you'll most certainly want to know about and study with), I figured that both of them must have studied intensively at Wilson's Shala. Each, in their own perfect and distinct voice, embodies the movement to restore yoga's name, dignity, and its practical relevance to real lives. I know they're not alone in that. And I also know it can feel lonely out there in Yoga-Land when there's so much in-your-face emphasis on photographable pretzel poses and such short shrift given to the practice's promise to declutter our minds. We can stop battering our nervous systems in the name of yoga and skillfully employ it for ease, serenity, and self-knowledge. Until we get that stuff straight, we're going to suffer physical and mental injuries and be of little service to anyone else.